One of my favourite foods is pasta, so being able to put together a pasta meal for under £5 is my idea of heaven. 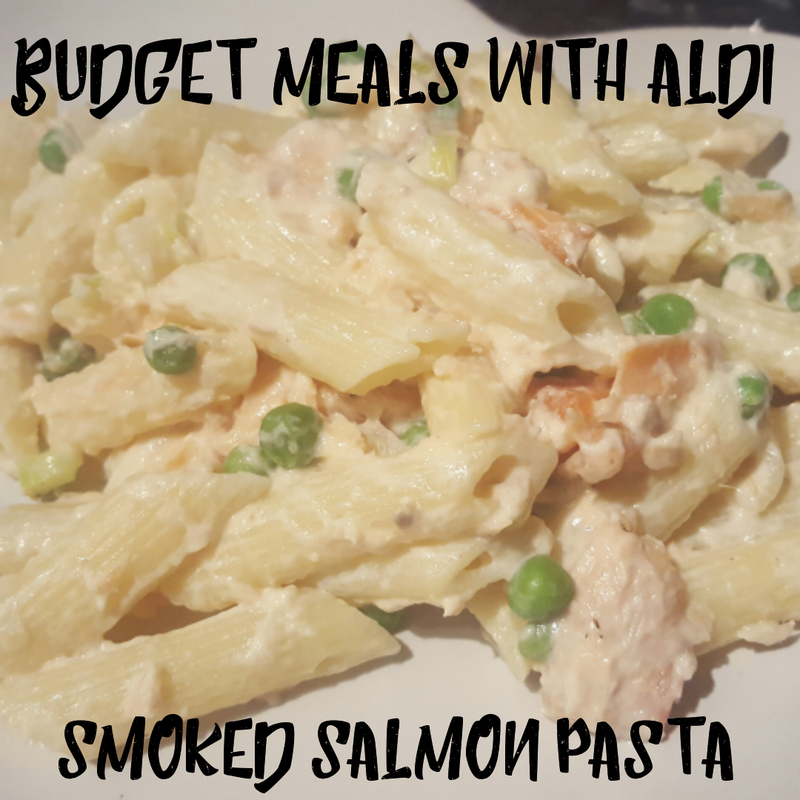 My second budget meal using all Aldi ingredients is Smoked Salmon Pasta. Bring a large pan of lightly salted water to the boil and add the pasta. Stir and cook at a rolling boil for around 8 minutes until al dente. Heat the oil in a small saucepan and sauté the garlic for 30 seconds. Cook garden peas for time specified and drain. Add the spring onions and continue cooking until softened. Stir in the crème fraîche and peas and then the salmon flakes, heating very gently. Drain the cooked pasta, return to the pan and add the sauce. Stir gently to mix through. Sprinkle with parsley and some Parmesan cheese. Typically when i go to Italian restaurants i will order a creamy pasta dish. This smoled salmon pasta was so good, i added 2 packs of salmon flakes as i really love salmon. Instead of peas next time i might add asparagus to make it a bit different. Not only is this meal afforable and feeds a family of 4, it's quick to make aswell. Now that i work full time, it's important that i can make my own meals in around 30 minutes. 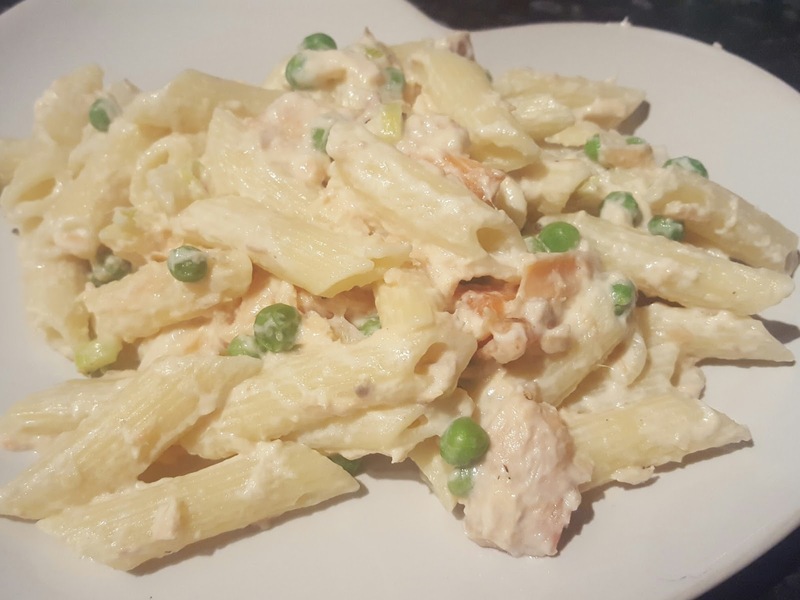 So if like me you love your pasta AND want a quick meal then this one is for you. Keep your eyes out for two more budget meal recipes next week on the blog. 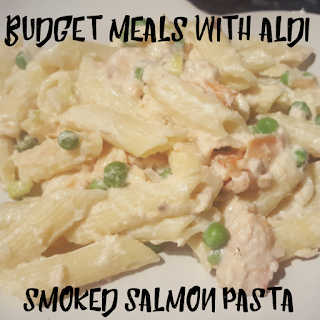 *Disclaimer: I was given Aldi vouchers in order to buy ingredients to prepare these meals. As always all thoughts and opinions are 100% my own.